This Barkley House wedding was beautiful, from beginning to end. First, Melissa and Mike are two of the loveliest people. They were both incredibly good-natured, kind, and just so darn happy to be marrying each other that they literally giggled all day long. And their taste in wedding decisions was flawless. 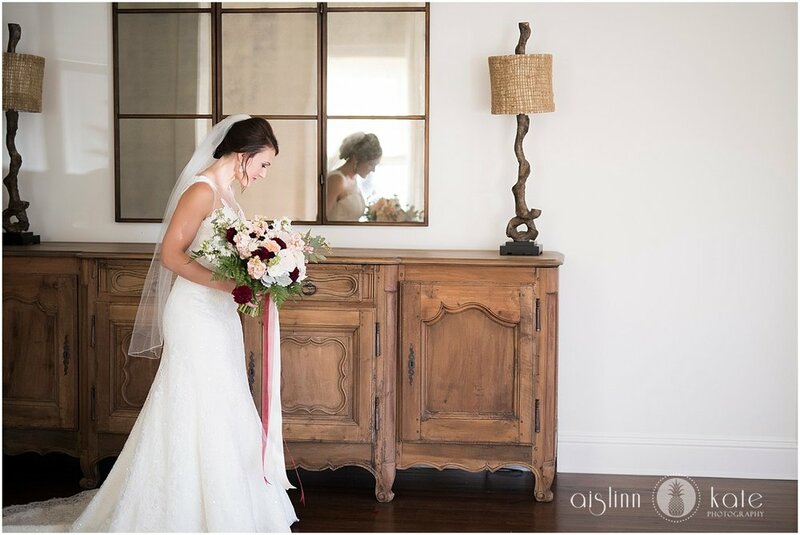 They chose lush florals in shades of blush and burgundy – garden roses, giant dahlias, and delicate scabiosa made up Melissa’s oversized deconstructed bouquet. I loved the hand-dyed ribbon used to decorate the stems (seriously, ribbon fluttering in a breeze has my HEART). They strung plenty of market lights to light up their outdoor reception, and their guests danced the night away against a background of glittering lights. This garden ceremony was shaded by an ancient oak tree, and the outdoor wedding reception featured a coffee bar and a custom popcorn station, as well as an adorable, vintage photo booth in a restored Volkswagen bus.